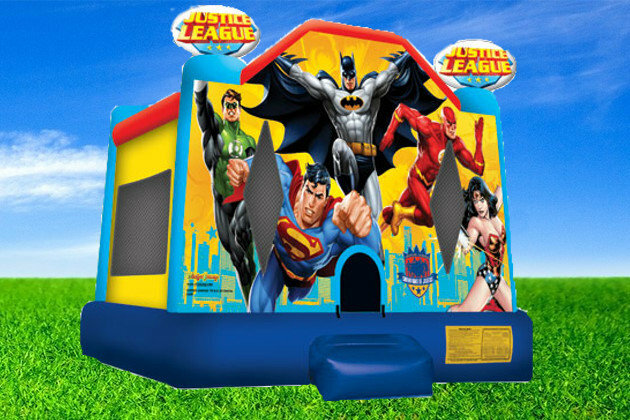 Justice League Bounce House Rentals | BounceGeeks.com Richmond, VA.
Never fear, the Justice League is here! This gathering of super heroes is really awesome! We have Green Lantern, Batman, Flash, Superman and Wonder Woman! You will also be a super hero to your little one when you get them this super cool large bounce house. Everyone will stay safe as the parents can easily see inside through the safety netting, and also features inflated entry/exit step. We set this up for a birthday party in Richmond, VA and the kids were so happy when they saw it.